This is very much a work in progress, just to keep me thinking about it. I have used Parallel Port controllers as a very simple switch and sensor, this project is to develop a very low-cost simple computer controller for robot of a reasonable size. The basic circuit above only shows one relay, but this chip will support up to 7 relatively large 12V relays. 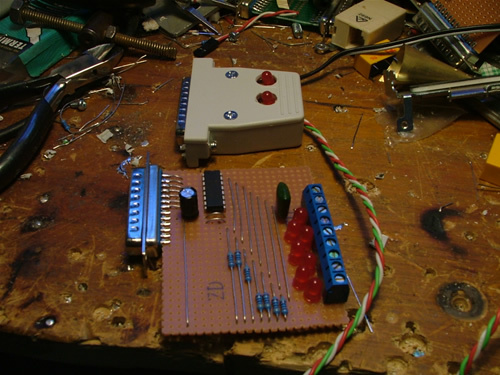 Above are two examples of previous projects, one is made inside a D Connector, and the other is a test unit with LEDs and terminal block. 1. Main motor controls are not powered up until system in right state (so it does not matter if PC data pins change state at boot-up).